Posted on January 24, 2019 at 2:34 pm. 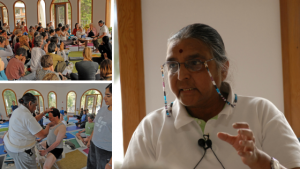 In the spring of 2008 Geeta Iyengar came to Yasodhara Ashram as a guest teacher for an ascent magazine intensive. It was another moment when the two lineages of Swami Radha and B.K.S. Iyengar came together. The first time Geeta and Swami Radha met was in Pune, India in 1982. There, along with Mr Iyengar, they engaged in exploring the work each was doing. From these conversations, further meetings took place in Canada and Timeless Books became the first publisher of Geeta’s Yoga: A Gem for Women.